The leading independent specialist for windscreen replacement and windscreen repair based in Worcester and serving all of the Worcester area. National Windscreens Worcester fitting centre provides windscreen replacement and windscreen repair services to businesses and individuals throughout Worcester and the Worcester area. 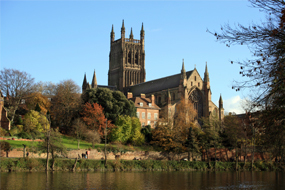 Worcester is a city located on the River Severn in Worcestershire, 30 miles southwest of Birmingham. The city is well connected through the A449 as well as the M5 which provides access to Cheltenham, Gloucester and Bristol to the south and Birmingham and Manchester to the north. The most famous landmark in Worcester is the imposing Cathedral. The current cathedral dates back as far as 1084. The town offers a huge variety of retail shopping as well as a busy nightlife. The Worcester windscreen fitting centre and its mobile vehicle glass technicians service the needs of Worcester and the surrounding area including Redditch, Evesham, Bromsgrove and Droitwich Spa. With 108 fitting centres and over 800 mobile technicians, National Windscreens operates the UK's largest windscreen repair and windscreen replacement network. The company provides low cost, high quality windscreen replacement and windscreen repair from its Worcester fitting centre 24 hours a day, 7 days a week, 365 days a year. Repair and replacement of all types of vehicle glass including windscreens, rear windows and side windows is undertaken throughout Worcester and all of the Worcester area. National Windscreens is a registered company in England & Wales. Registered Number 1612587 VAT Number 322 1657 86. Calls may be recorded & monitored for training and quality purposes.